Smok introduces new replcement coils for TFV8 Baby V2 tank. Baby V2 S1 and S2 coils are also designed for Stick series battery such as Mag Grip. and purer flavor. Get the replacement coils for your tank and kit, enjoy larger airflow and rich flavor. 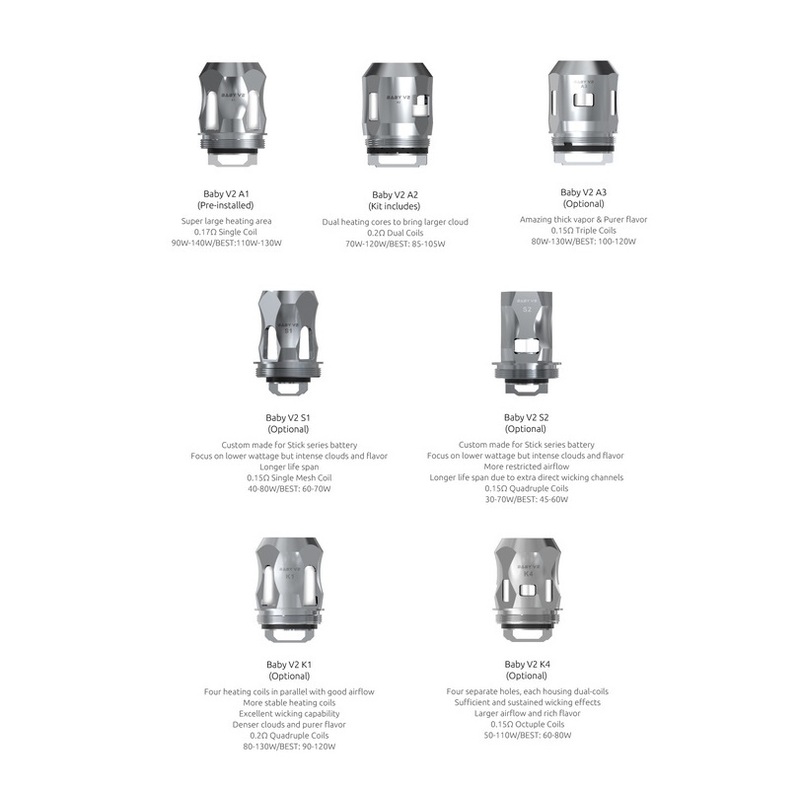 Smok TFV8 Baby V2 Tank Replacement Coil Heads include A1, A2, A3 core. A1 coil has a large hole inside for enlarge the area to cover the cotton. So I recently purchased the smok Stick V9 max. Very impressed with the device. Came with a V2 S1 and V2 S2 coil. The s1 was decent then after about a week swapped it out for the s2. I absolutely love the s2. The flavor that comes through is amazing and produces a lot of vapor too. I’ve noticed with most coils and higher by liquid that the flavor is somewhat muted but with these it is outstanding. Definitely recommend these coils to use with the v9 max. Q: Can the v2 s2 quad coil be used with the Smok resa stick? A: No these coils are not compatible with the Resa stick.